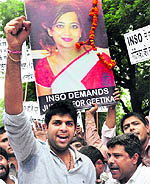 The Delhi Police on Friday claimed to have pieced together the jigsaw puzzle of the suicide of air hostess Geetika Sharma and the alleged role of Haryana ex-minister Gopal Goyal Kanda in the case. A day after a combative Congress president Sonia Gandhi told party MPs to launch an offensive over CAG�s report on coal blocks allocation, the UPA government swung into action today to hit out at the Opposition. The Supreme Court today absolved Finance Minister P Chidambaram of all the four charges in the 2G spectrum scam, providing a major relief to him and the Congress-led UPA at a time when the government is facing a tough time in Parliament following allegations of irregularities in the allocation of coal blocks. Less than six months after the trial court acquitted Bibi Jagir Kaur of murder while convicting her for abduction and forcible abortion of her daughter Harpreet Kaur, the Central Bureau of Investigation (CBI) has claimed that the SGPC�s former chief had conspired to kill. An Sikh man in his early 70s was allegedly beaten up by his neighbour in New Jersey following an altercation and was later arrested by the police for keeping a kirpan, a Sikh article of faith. Washington: US First Lady Michelle Obama travelled to Oak Creek City in Wisconsin to meet the victims of the gurdwara shooting. Sikh community leaders said her visit went a long way to assuage the feelings of hundreds of Sikh families across the nation. 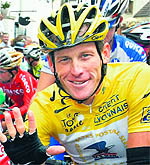 Seven-time Tour de France champion Lance Armstrong said he would no longer fight doping charges by the US Anti-Doping Agency, which quickly said it was stripping him of his titles and banning him from competitive cycling. Armstrong, a cancer survivor considered one of the all-time greats in his sport, made the announcement in a written statement as he faced a midnight deadline on Thursday to formally challenge the accusations against him.